We’ve now got a guide up for Pokémon Musicals in Pokémon Black/White. While they’re not as involved as contests, your participation is required in them if you wish to complete your Trainer Card and they are a fun distraction from the main game. Given the lack of information on Pokémon Musicals despite the length of time Pokémon Black/White has been out I hope this guide is useful. Click here to go to the Pokémon Musicals Guide. After the working Pokédex the next most popular option on our poll (located on the right hand menu) is more information on old games. As such I have been doing just that today and have added a Pokémon Fire Red/Leaf Green section. More information including other games coming soon. Edit: We now also have a Pokémon Gold/Silver Section. Edit 2: We’ve also added a Daily/Weekly Events page to our Pokémon Black/White Game Guides section. America celebrates Zoroark all month! Nintendo seem to be liking Zoroark at the moment, in fact, they’re dedicating the whole of the month of September to him. The main attraction is that between September 18th and September 25th, Toy’s R Us stores across America will be giving the Illusion Fox Pokemon away. Copying the World’s Toy Fair Zoroark given away to Japanese players earlier in the year, Zoroark comes at level 50 and knows Snarl. Assigned to TM95, Snarl is a dark type move which will lower the target’s Special Attack lower that is currently unavailable in Black and White, so if you want this move on any compatible pokemon, you’ll want this Zoroark to breed it onto them. But wait, there’s more. Head to Pokemon.com on either the 17th or the 18th of September and you can see the complete, full version of Zoroark: Master of Illusions, The 13th Pokemon movie will be shown on the website during those two days, ahead of the DVD release of the movie in the USA on the 20th. Want to win a copy of the movie? Well the website has you covered too, head here and enter the competition before October third where the grand winner will win a copy of the movie on DVD, a Nintendo 3DS, A copy of Pokemon Black, A copy of Pokemon White, the Zoroark Illusions TCG Promo box, an entire box of TCG booster packs from the latest TCG set (emerging powers), a deluxe Zoroark action figure and a copy of Zoroark: Master of Illusions manga. Now THAT’s a prize. Between now and then, 25 winners will be picked each week and will win a copy of the DVD, the Zoroark TCG Promo Box and the Action Figure. Get entering now! I should have posted this yesterday, but i’ve been a little addicted to the adoption agency myself… whopps. Next item, Remember that Online Program on found on the official Pokemon site which allowed you to learn the Trading Card Game, along with playing against AI controled opponents? Well that’s due to go full version which allows you to collect cards, build your own deck and play against other, real people online. Well the program has entered the open beta stage. What this means is that anybody can now play against other people online, as well as get cards and build decks… BUT since its still in beta stages, it may not work 100% and there may be still bugs to work out. Still, if you dont think the AI opponents were challenging enough, or you want a bit more customised deck than the pre-constructed decks, then you may want to start using it now. Speaking of Pre-constructed decks, the latest TCG, Emerging Powers, set has had their theme decks this week, with the booster packs being sold in a couple of weeks time. Both Toxic Tricks (a psychic/fire deck) and Power Play (a Fighting/Water deck) have online codes which will allow you to play those decks in the Trading Card Online… see, its all connected! Incidently, the next English TCG set has been announced as Noble Victories and will be based around Victini (well not the whole set, but Victini will feature in it, and probably be in both Theme Decks as there are different types of Victini cards, it could work (theme deck wise anyway) like Arceus did in the Arceus set, where there was a different Arceus in each Theme deck. Noble Victories will be out sometime in november. Sorry for the lack of updates, but to be honest its been a bit of a news lull around here… and we’re busy behind the scenes on various things relating to and not relating to the website. News comes out of America today that was completly expected eventually. The new 3DS game IS getting an english port. 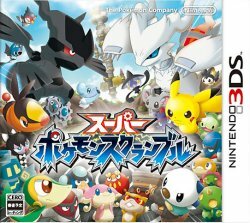 Now renamed Pokemon Rumble Blast, the 3DS game will be out on October 24th in America. An updated version of the Wiiware game, Pokemon Rumble Blast features all Pokemon from Black and White as well as those of the older games, all in toy form. It also has a few new modes, including Charge Mode (where you take control of a team and charge into battle like 2 armies) and Team Battle (Where you control 3 Pokemon at once) as well as having Street Pass functionality. No details on a European Release (yet, expect one in the next couple of months), but there IS a trailer available, which you can see below. The big N kept this quiet but in a couple of weeks on July 28th, Japan will have a brand new Pokémon game released on the 3DS. Dont worry, its not a 3D version of Black and white, and the chances we’ll get it over into the West is fairly high as well. Super Pokémon Scramble is a successor to the Wiiware game which was renamed Pokémon Rumble over in English Speaking Countries. The game saw you controling a toy version of a Pokémon, battling other Pokémon and, of course, collecting other toy Pokémon to use as well. Being a full game rather than a download title, the 3DS version will have new additional modes, along with more Pokémon to obtain. To start off with, Many of the new Pokémon from Black and White will be in the game along with Pokémon from the older generations. Super Pokémon Scramble also comes with Street pass capabilities, allowing you to Exchange team info with anybody you pass by as you walk around with your 3DS in sleep mode. Once you’ve got a street pass from someone, you’ll be able to fight thier chosen pokemon as a boss battle. Super Pokémon Scramble is released for 3DS in Japan on July 28th. A Western Release is unknown at this time. Wow, I am really behind on the news front – sorry. I’ve been very busy, and ill and very busy again… not neccessarily in that order. Thankfully not a lot of news has been released while i’ve been on hiatus – but the Japanese Movie Giveaway has been given more details. While Pre-ordering your tickets will get you a Victini, the pokemon you get for actually seeing the movie itself actually depends on your game. Black players can get Zekrom while White players will be able to get Reshiram. Since this is the other legendary beast that you capture normally during your game, this will allow all those japanese players to complete the set. And now for the latest, and in my opinion greatest news from the Pokemon camp. On Monday evening the 6th of June for the US and Tuesday Morning the 7th June for the UK/Europe, an update for the Nintendo 3DS will be made available, allowing the Internet Explorer to be used along with giving us access to the new eShop. One of the first programs being made available will be a Pokedex ‘app’ that will not only allow you to view stats, move lists, breeding groups and other usefull information on all Unova Dex Pokemon, but allow you to see all these pokemon in Full 3D, Take pictures in both Pre-rendered backgrounds and in real life (with the use of Augmented Reality). And best of all, this Pokedex will be completly free! Good news – the global link is now active and available for use by everybody around the world. By syncing your game with the site using the c-gear, you can access the dream world letting you catch pokemon not available in Black/White normally, along with getting pokemon with abilities they would normally have. There are other things you can do on the global link, which our forthcoming guide will explain. The US website for Black and White has announced that Toy’s R Us is holding an event April 27th and May 31st that will allow you to get a secret egg. The egg is the same one that was given away in Japan several months ago, which was done to coincide with Ash getting an egg in the Anime Series. The pokemon you get inside has nothing to do with the pokemon that’s in Ash’s Egg (that was given away seperatly in Japan) but it does link in with the Anime Series anyway. Inside the egg is one of 3 pokemon, you’ll get one of them randomly and you have no idea which you’ll get when you download the egg. The 3 possibilities you could get are Ash’s Pidove, Cilian’s Pansage or Iris’s Axew. Each will come with 4 preset moves, a preset nature and one of thier IV’s at its maximum level. Over in the UK, we havent missed many of the events that have ended up in America in the past few years, but whether this event will come out over here is currently unknown. The Liberty Pass event that allows you to get Victini has been extended in Europe. It was due to end on April 22nd but has been extended till April 27th. America’s event was due to end on the 10th of Arpil, but while it hasnt officially been annoucned as being extended, it still seems to be ongoing. It may be available until April 27th as well, but if you havent got it you may just want to try and download it right now. Speaking of Victini, the Victini being given away as a Pre-order bonus for the latest Pokemon Movie in Japan has had its details announced, available from April 16th until August 31st, Anybody who pre-orders thier movie tickets will be able to get a level 50 Victini, holding a Fire Gem in a Cherish Ball and has a Wish Ribbon (meaning it cant be traded on the GTS) – it will know V-Create and Searing Shot, along with Fusion Flare and Fusion Bolt, the signiture moves for Reshiram and Zekrom. No word yet on what, if anything, will be handed out to the people who go to Movie itself. We’ve been busy updating our Pokémon Black/White section today and we plan to have more guides up in the next coming days to help you along while you play Black/White. We’ve also added a menu section devoted to them on the left of each page to make them more easily accessible. Look out for more to come in the near future! Finally, after every other country in the world had gotten details on thier Celebi give-a-way, the UK finally gets its details… and by the looks of the dates it got them increadibly late. Today is Wednesday (at least it was when I posted this) and the first set of events are starting this Saturday – that’s in 4 Days time. And after that, there is only 1 other weekend of events.